Nearly 1,000 men were killed over a two-day period this month in the Central African Republic, according to Amnesty International. The human rights group said Wednesday that war crimes and crimes against humanity are being committed in that country. "Crimes that have been committed include extrajudicial executions, mutilation of bodies, intentional destruction of religious buildings such as mosques, and the forced displacement of massive numbers of people," said Christian Mukosa, Amnesty International's Central Africa expert. The country has seen violence and chaos since the Muslim-backed Seleka militia and other rebel groups from the marginalized northeast seized the capital Bangui in March. President Francios Bozize fled to Cameroon, and Michel Djotodia, who had been one of the Seleka leaders, made himself President. 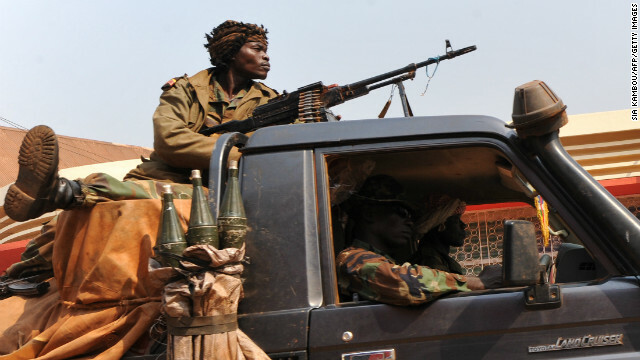 Djotodia later officially disbanded the Seleka, but as many as 15,000 kept their arms and instead continued to wreak havoc in Bangui and elsewhere. They mainly targeted Christian communities, which in turn formed their own vigilante group, the anti-balaka (literally "anti-machete"). Anti-balaka forces staged an early morning attack in the capital on December 5, going door to door in some neighborhoods and killing approximately 60 Muslim men, Amnesty International said. De facto government forces, known as ex-Seleka, retaliated against Christians, killing nearly 1,000 men over a two-day period, according to the rights group. A small number of women and children also were killed. In a statement, Amnesty International called for the deployment of a "robust" U.N. peacekeeping force, with a mandate to protect civilians, and enough resources to do so effectively. "The continuing violence, the extensive destruction of property, and the forced displacement of the population in Bangui are feeding enormous anger, hostility and mistrust," said Mukosa. "There can be no prospect of ending the cycle of violence until the militias are disarmed and there is proper and effective protection for the thousands of civilians at risk in the country. Residential neighborhoods must be made safe as an urgent priority in order to allow people to go back to their homes and resume their normal lives." The Central African Republic is about the size of France and a country rich in resources, including diamonds, gold, timber and ivory. The former French colony has rarely seen political stability or economic growth in the 53 years since it gained independence. Central African Republic soldiers patrol a street of Bangui last year. Days after a coup plunged the Central African Republic into chaos, looters roamed the streets of the capital, robbing hospitals and preventing fearful residents from seeking treatment. A coalition of rebels ousted President Francois Bozize this week, the latest in a series of coups since the nation gained independence from France in 1960. After the deposed president fled the nation, a rebel leader declared himself in charge and urged residents to welcome the new leadership. 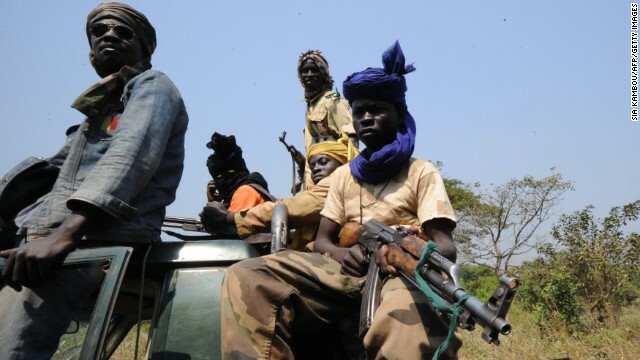 Seleka rebel coalition members in a village 12 kilometers from Damara, on January 10. Central African Republic President Francois Bozize is in Cameroon after rebels took his country's capital on Sunday, Cameroon state TV reported Monday. Bozize is seeking refuge in Cameroon but hoping to move to another country, the report says. Bozize fled the Central African Republic's capital, Bangui, after rebels seized control of the city, a government official said Sunday. A written statement from an official with the Seleka rebels referred to Bozize as the country's former president and urged residents of the landlocked country to remain calm and prepare themselves to welcome rebel forces.